Based on the novel by J. Storer Clouston, The Spy in Black is the story about a German U-boat captain who falls for his contact in Britain during World War I. Directed by Michael Powell and screenplay by Emeric Pressburger from a scenario by Roland Pertwee, the film marks the first collaboration between Powell and Pressburger that would help define British cinema. Starring Conrad Veidt, Valerie Hobson, Marius Goring, and Sebastian Shaw. 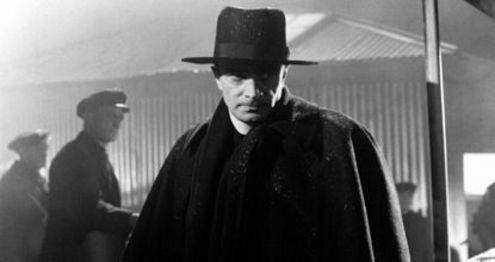 The Spy in Black is a gripping yet engaging film from Michael Powell. Set in 1917 during World War I, the film revolves around a scheme by a German U-boat captain who goes on an assignment to meet spies working for the Germans pretending to be British citizens. It’s a film that is about spies and conspiracy where a captain is trying to find ways to create a sneak attack on a British fleet at the Scapa Flow in Britain. The film’s screenplay by Emeric Pressburger explores the ideas of what spies do to become someone else and take on a role but also how they have to maintain an act of deceit where they blur the lines of what side they’re playing for. Especially as this U-boat captain in Hardt (Conrad Veidt) who is eager to help the Germans win against the British at any cost where he finds himself arriving onto the Orkney Islands where he meets and falls for his German contact in a woman named Fraulein Tiel (Valerie Hobson) who is pretending to be a schoolteacher she and other agents had captured. Adding to this growing complication is the disgraced former British naval officer Ashington (Sebastian Shaw) who aids Hardt in the scheme as Hardt suspects about a relationship he had with Tiel. It adds to some of the tension that is looming but also has some layers of secrets about what is really going on where Hardt suspects something isn’t right about Tiel nor Ashington. Michael Powell’s direction is quite simple while having a flair for style in the way it uses stock footage for shots set in the sea or in battle. Shot on various locations in Britain with much of it shot at Denham Studios, Powell creates a film that explores the world of spies and how they operate where Powell’s usage of medium and wide shots in some of the locations and scenes are quite engaging. Especially in his close-ups as it adds to some of the suspense and drama that looms throughout the film which include scenes involving Hardt and Tiel. There are moments of suspense in the way Powell creates through some scenes as well as some of the moments in the third act as it has some big reveals but also some compelling ideas of war and how some conduct themselves during wartime. Overall, Powell creates a riveting yet sublime film about a U-boat captain taking on a secret mission with the aid of spies in Britain during World War I.
Cinematographer Bernard Browne does excellent work with the film‘s black-and-white photography as it play into some of the scenes at night with its usage of shadows and low-key lights that add a lot to the suspense. Editor Hugh Stewart does nice work with the editing as it is mostly straightforward as it also include some stylish usage of stock footage. Production designer Vincent Korda and art director Frederick Pusey do fantastic work with the look of the house the characters would stay in for much of the film‘s second half as well as some of the interiors of the submarine that Hardt is the captain of. The sound work of A.W. Watkins is terrific for the usage of sound effects as well as in some of the sparse moments in the sound. The film’s music by Miklos Rozsa is superb for its orchestral score as it play into the suspense and drama while not going overboard as it favors lush and low-key moments rather than bombastic pieces. The film’s incredible cast feature some notable small roles from Cyril Raymond as Reverend John Harris who is supposed to marry the woman Tiel is pretending to be, Hay Petrie as a ferry engineer, George Summers as a ferry captain, June Duprez as a schoolteacher that Tiel would pretend to be, Mary Morris as a chauffer who is really a German spy, and Marius Goring as Hardt’s fellow officer Lt. Schuster who would take command of the sub in place of Hardt. Sebastian Shaw is excellent as Lt. Ashington as a disgraced British officer who decides to help Hardt in planning the attack on the British fleet while being quite ambiguous in what he does outside of the house. Valerie Hobson is brilliant as Fraulein Tiel as a spy who pretends to be a British schoolteacher as she tries to maintain her professionalism and sway the advances of Captain Hardt. Finally, there’s Conrad Veidt in an amazing performance as Captain Hardt as a U-boat captain who is trying to plan an assault on the British fleet where he copes with working with spies and hope for a victory for Germany. The Spy in Black is a remarkable film from Michael Powell. Featuring a great cast and a compelling script by Emeric Pressburger, the film is a fascinating spy-thriller that play into the world of war and what some will do to survive. In the end, The Spy in Black is a marvelous film from Michael Powell.